Cincinnati small business owner and EO global board member Kristin McLane speaks at United Nations International Council for Small Business forum about the need and rationale for global development of women entrepreneurs. 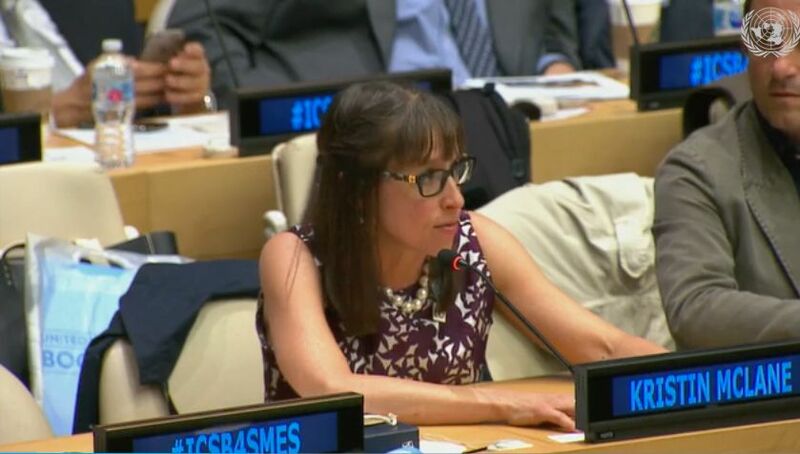 CINCINNATI - May 17, 2018 - PRLog -- CIMx Software President and Entrepreneur Organization (EO) global board member, Kristin McLane was invited to address the 2018 International Council for Small Business at the United Nations. The "Creating a Shared Future for Entrepreneurs and Micro-, Small and Medium-Sized Enterprises in the Framework of the U.N. Sustainable Development Goals" forum was the first Saturday symposium in the United Nations headquarters' sixty-six year history. Cincinnati native, manufacturing technology entrepreneur and global advocate for women in business; McLane spoke to both the impact of woman owned businesses in their communities and the need for United Nations support of women in business around the globe. McLane's passion for leadership development was on display when speaking about the obligation of entrepreneurs to strengthen their communities. "With opportunity comes responsibility. Entrepreneurs have both the resources and responsibility to make things better: better jobs, better economies, and stronger communities… We have the ability to move mountains, but we need the freedom to do it." When addressing the need for global collaboration to increase female access to start-up resources, McLane stated, "Female entrepreneurs bring life to both business and the next generation… and yet, women in all areas of the world face constant challenges in health, personal safety and opportunity." She went on to call the assembly to action by reminding them that, "Entrepreneurs do not fear the [rising tide]… they see the possibility of the water within." Kristin McLane founded CIMx Software in 1996 and joined the Entrepreneurs Organization (EO) one year later. After years of dedicated service, McLane was promoted to a member of the Global Board of Directors for EO in 2017. She promotes ethical business leadership across the globe while continuing to grow her business using software to innovate manufacturing.